Today, our good friends, the Carnahan's, are traveling to Africa to share the love of the Gospel, a message of hope, to the people of Rwanda. David, Hollie, McKenzie, and Taylor have been sponsoring four children there and will actually get to meet these kids and love on them, among other things. The Carnahan's worked very hard selling bread and homemade meals to raise money for this trip. We are excited for them, inspired by them, and are praying for them. Please join us in praying for this family, for the people whose lives they will touch, and for the message of the Gospel to be disseminated clearly. You can follow the progress of their trip over at The Carnahan Chronicles, as David plans to write while there...so check back! Our hearts have been drawn to Africa more and more as we've been touched by friends who have actively ministered to various countries there in some way. I think of my sweet friends, the Blair's, who adopted their precious daughter, Elle, from Addis, Ethiopia last year. You can watch an incredible video of their journey to get their daughter here. 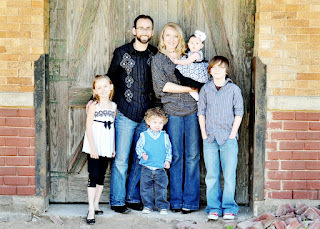 Another family that I've been following, though I do not know them personally, is the Freeman Family. I came to read about them through my sweet bloggy friend, Brandi, over at The Marathon Mom, and have been praying for the Freeman's since. The Freeman's are missionaries in Swaziland. It's been so neat to learn how God is using them there, and to read of what every day life is like for this homeschooling mom of four. You can read of their adventures here and here. These families have prompted us to learn more about Africa. Praying for the people, watching documentaries (ranging from medical conditions there, to hunger, to the genocide), and simply knowing where these places are on the map. Please pray for our friends, for the people of Africa. I am so thankful for those willing to go there to meet needs, and share the good news of the Gospel. I am also thankful for missionaries all over the world, including in the United States. We are all missionaries if we listen to when God is calling us to act, whether it's to the neighbor next door....or the far reaches of the world. What are you thankful for? Are you praying for any missionaries specifically that you would like to share? This post is linked up with The Marathon Mom.